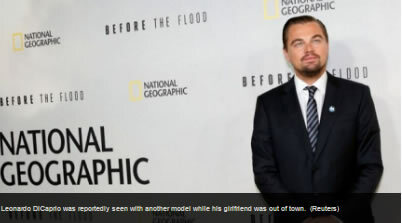 On Thursday, DiCaprio — plus his “wolf pack” including Lukas Haas and Tobey Maguire, and a group of models — went to Catch in LA, where a spy told the New York Post DiCaprio and Watkins took a number of smoke breaks together outside. Later, the group headed to 1Oak, where an eye-witness said things heated up between him and the Florida-born bikini stunner. Agdal is said to be away on a modeling shoot. while eating at a Mexican taco stand. DiCaprio has been dating Sports Illustrated model Agdal since June. They were seen together in Tulum, Mexico, last week, where Agdal was doing a beach shoot. They also spent Thanksgiving in Charleston, SC, and vacationed on a swanky and very expensive private island in French Polynesia last month. Other sources tell the paper that DiCaprio and Agdal are still very much together and have plans to travel to St. Barts over the holidays.